(CNN) -- The murder of rapper Dolla reverberated throughout the music industry on Tuesday as police sought a motive for the brazen killing. Rap artist Dolla was known as a nice guy who survived a rough childhood. The aspiring Southern hip-hop artist, whose real name was Roderick Anthony Burton II, was gunned down in the busy parking lot of the upscale Beverly Center mall in Los Angeles, California, on Monday afternoon. Police later arrested Aubrey Louis Berry, 23, at Los Angeles International Airport, a Los Angeles Police statement said. No other details were given about Berry. The 21-year-old rapper was based in Atlanta, Georgia. He was in Los Angeles to work on his debut album. Those who knew him said that despite coming from a rough background, Burton was extremely gracious and polite. "Everything with Dolla was 'please' and 'thank you,' " said Ant Rich, manager of A&R for Jive Records, who discovered the rapper for the label when Burton was 17 and helped sign him a year later. "The streets did not define him at all. He was bigger than that." Dolla was a protégé of singer Akon, who collaborated with him on his first single, "Who the F--- is That?" which also featured another high-profile artist, T-Pain. Another Dolla song, "Feelin' Myself," appeared on the soundtrack to the 2006 movie "Step Up." According to his official MySpace page, Dolla was born in Chicago, Illinois, and his family relocated to Los Angeles soon after. He was 5 years old when he and his older sister, Divinity, witnessed their father committing suicide. After that incident, their mother moved the family to Atlanta, according to his biography. "First and foremost we, the family, would like to thank everyone for all their kind thoughts and prayers. Furthermore, the family would like to note that rumored details of the shooting on popular Web/blog sites are false. "Due to the circumstances of the situation, no other information will be released at this time. We are grateful for your continuous support and would be very appreciative if we could mourn this loss in private. "Additionally, information released before and after this official statement are not confirmed nor should they be considered accurate." 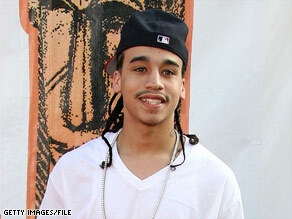 Rich said Dolla, who also did some modeling for P. Diddy's Sean John label, loved his family deeply. He was the guy with the great smile who would do things like offer to pick up the bill after a meeting with music executives, Rich said. "You would tell him 'Look Dolla, you don't have to do that because we get reimbursed for this' and he would say 'No, no you got it last time, let me,' " Rich said. "The world lost a really good kid and he had the biggest heart." DeAngelo Jones books talent for BET and got to know Dolla after he performed at the network's "Spring Bling" event last year. He said the artist was humbled and grateful for the success he was starting to find in the industry. "That energy was what drew me to him," said Jones, who stayed in touch with Dolla after the show and often ran into him at other events. "A lot of times there are negative associations that go along with being a rapper, but he was not at all what the image of a rapper is portrayed to be." Jones said he was at the Beverly Center only a short time before the shooting occurred. Jones said it was unfortunate that Dolla's slaying is yet another incident that will link hip-hop with violence. "Hip-hop gets such a bad rap, ever since the deaths of Biggie and Tupac," Jones said. "[Dolla] just wanted to be successful, help other people and do the right thing. What's so hard for me is to see where his life was heading, because he was definitely on the right course." Jerry Barrow, senior editor for The Urban Daily, a publication devoted to African-Americans in pop culture, noted that it was unfortunate that Dolla is finding mainstream recognition posthumously. "With his modeling and his music, he did more before the age of 20 than many people do," Barrow said. "It's a shame that this is how many people are now discovering him and his music." Rashan Ali, a disc jockey with Atlanta's Hot 107.9 radio station, said the city has a thriving hip-hop community. Her station, which plays hip-hop, often has its lobby filled with aspiring artists trying to get their music heard. With the success of Atlanta-based artists like rappers T.I., Outkast, and Young Jeezy, more and more young people are drawn to the area to try and make the connections that will find them fame, Ali said. That Dolla was killed while pursuing his craft is especially sad, she said. "[Dolla] was minding his business, in Los Angeles trying to record his music and this happens," Ali said. "It's horrific and now a mother has to bury her child. It's senseless."